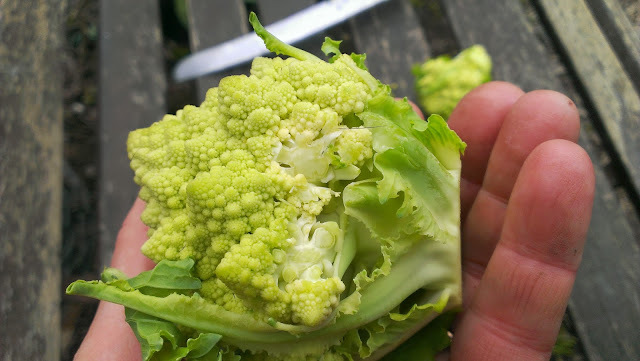 It's my first year growing Romanesco Broccoli. I confess I was tempted by its mad, lime-green, fractal-like spiralling curds. I raised them from seed and popped them in the patch in early April (I think). They grew well with a little lime to sweeten the soil and today I harvested my first decent-sized beauty. While they are called a broccoli, I found their growth form to be much more like a cauliflower. Certainly their leaves were much more like a cauli. I haven't tasted them yet - I have a back log of purple cauli that should be eaten first. Despite the fact that they have grown quite well, I will harvest only a few of those I put in because they were raided...you see yesterday my heavily pregnant ewes that had been let into the House yard to eat the luscious grass around the house down decided they wanted to sup on something else. 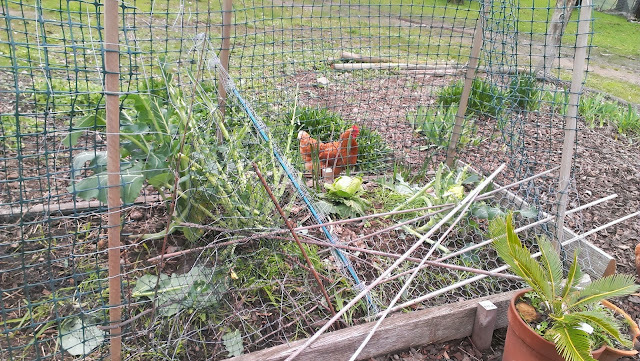 They broke into one of my temporary beds and devoured three Broccoli Romanesco plants. 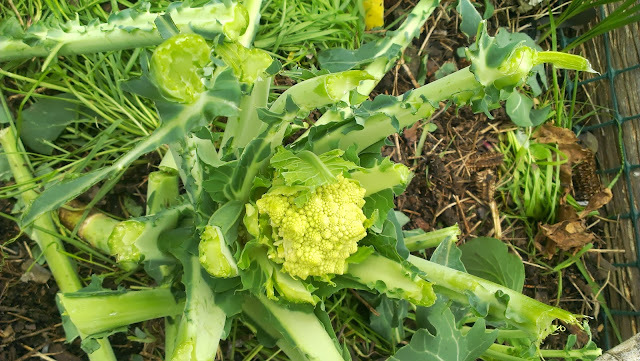 My big fat sheepy mothers ate most of the leaves of three of my Broccoli Romanesco - perhaps it was one of those pregnant cravings? While they ate the leaves they left the underdeveloped hearts which I harvested. Here are the tiny babies munched off in their prime ( in my hand and in the background). They did take a munch of one of the undeveloped heads - naughty sheep! While I am yet to taste them, I will probably grow them again, in part because I have more seeds and in part because I am still fascinated by the green spirals - next time I must keep the sheep off! I am contributing this post to Liz's Saturday Spotlight. Pop over to hers to see other varieties of vegetables highlighted. Oh no! I know all about sheep getting into the garden. Surely they can't get into Fortress Wallaby? Beautiful Romanescos though - well done. Naughty aren't they? The winter crops are all in my temporary beds. All the new plantings will be in Fortress Wallaby which I think will be secure from sheep and wallabies! oh I just popped a few seedlings in my garden today, what great timing, thanks for posting this! I'm so excited to see how mine turn out. Oh good luck with them, I hope they go well for you. I found them pretty good really. 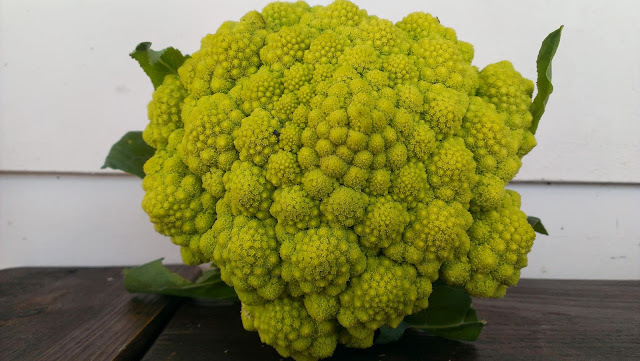 That first Romanesco looks like a prize winner! Darn sheep, at least they didn't eat the entire plants, they left the best parts for you. 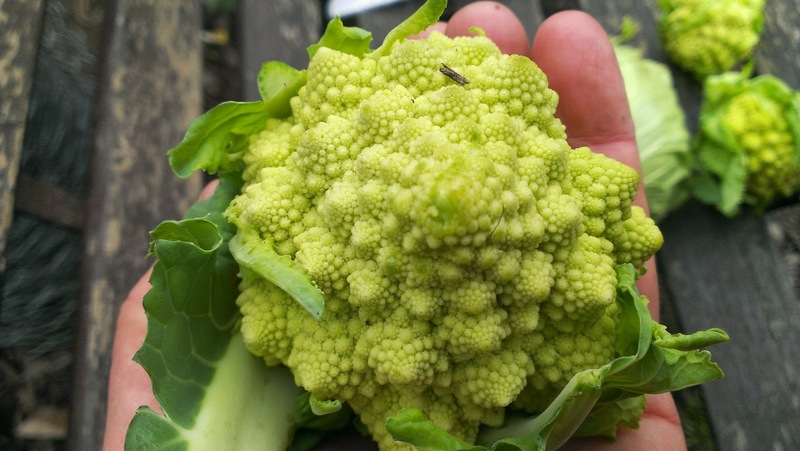 I adore Romanesco, it cooks like cauliflower but tastes, um, sweeter... less cabbagy. Dunno, but it's really good. And it's so weirdly beautiful too. A perfect example of a Fibonacci sequence (love to toss that phrase around, sorry). Well thank you! Shame it's not Agricultural Show time. And I hear that mini vegetables are 'in'. I found them like cauliflower too, I must say that I find all home grown brassicas less 'cabbagy', they are so much better than shop bought ones. Fibonacci sequence - is that like fractals? Must look it up. What ever it's called they are damn pretty things. Naughty ewes! Have they no respect! Or perhaps just very good taste. They look great. It tried Romanesco last year but I left them on the plant too long and ended up with something more like broccoli. The heads kind of separate as they mature. Sorry I failed to srite a spotlight this week. I linked to your post in my Monday Harvest post and will add it to the index. I will try harder next week. I figure I am just going to get even better lambs now that their mums have eaten fresh, organic lime green broccoli. No apology required at all and no need to try harder. If blogging is too much like work, its not fun anymore. In any case these were so much fun to highlight.